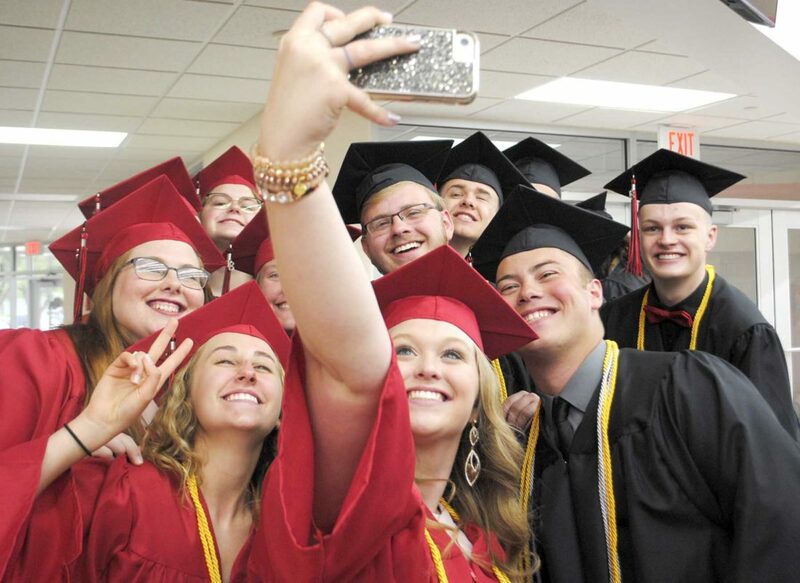 Algona High School Senior Rebecca Hommez, center, holds her phone out to take a pre-graduation selfie with a group of friends. 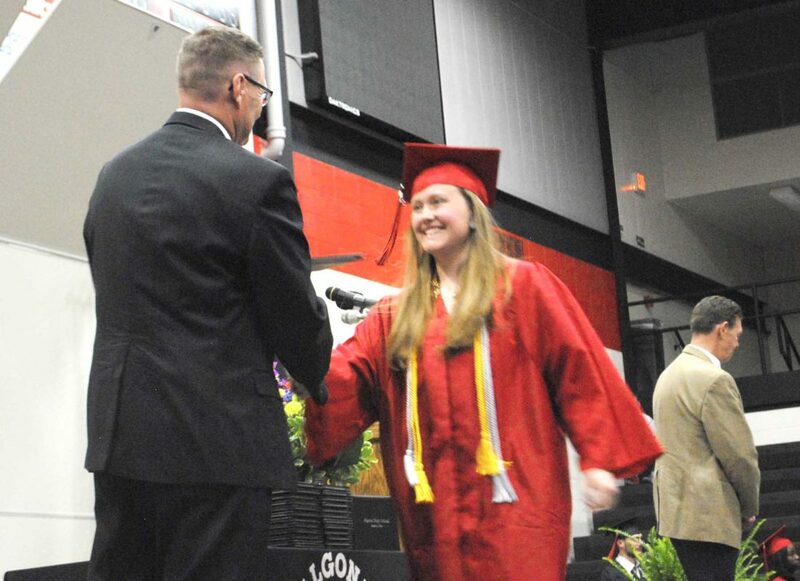 ALGONA — Algona Community School District welcomed 94 members into the ranks of alumni Sunday afternoon. Class of 2018 President Kali Garman described the class as having its own unique talents and successes in athletics, music or academics. “I believe this class is one of the greatest to have come through Algona High School,” Garman said. 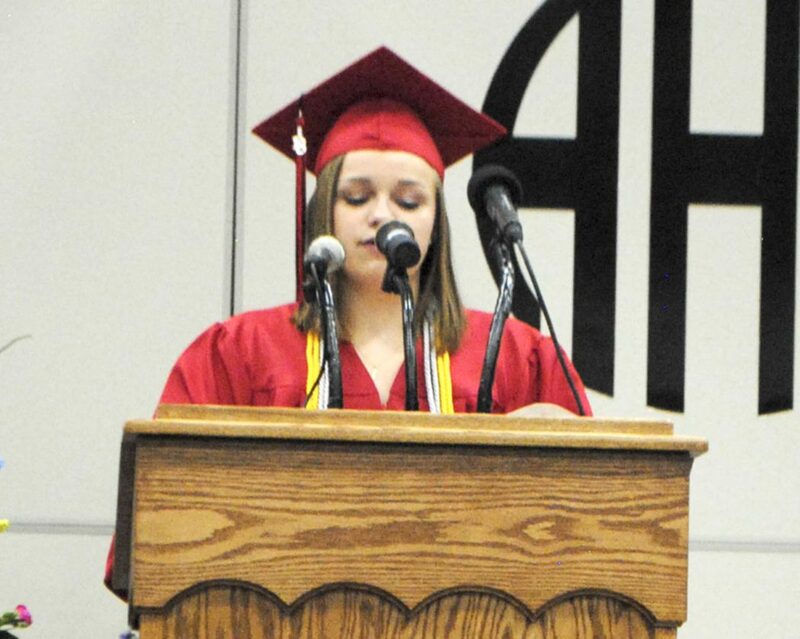 Garman said it has been the kindness in the class and community that made her experience in the Algona Community School District memorable. “Every day I saw us lifting each other up,” she said. 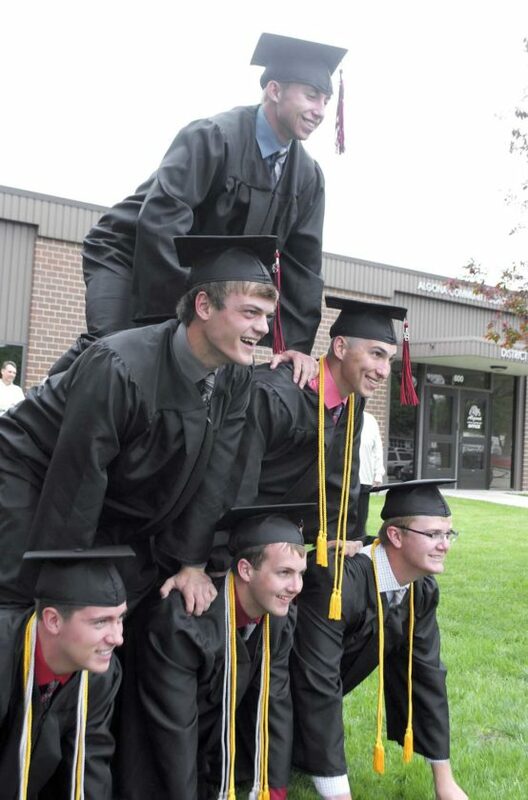 Trevor Bormann, top; Grant Goche and Nick Goche, middle row; and Cole Eden, Collin Sexton and Owen Harms, bottom row, form a human pyramid as they celebrate their graduation from Algona High School Sunday afternoon. 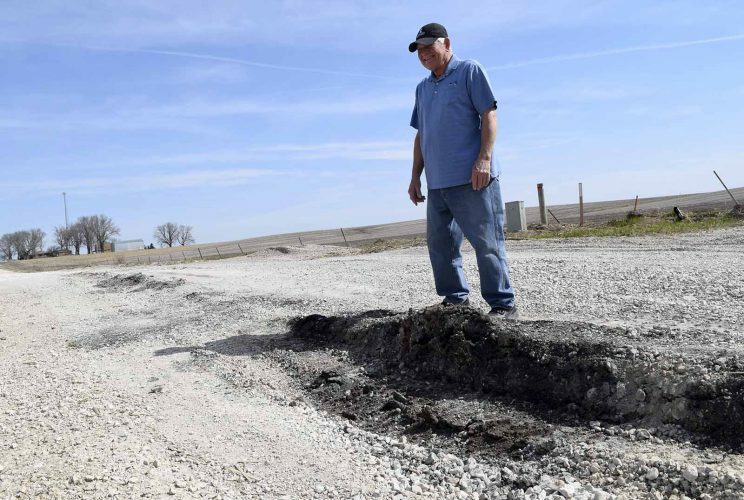 Garman reflected on how she experienced that kindness firsthand following an accident the summer of her freshman year. 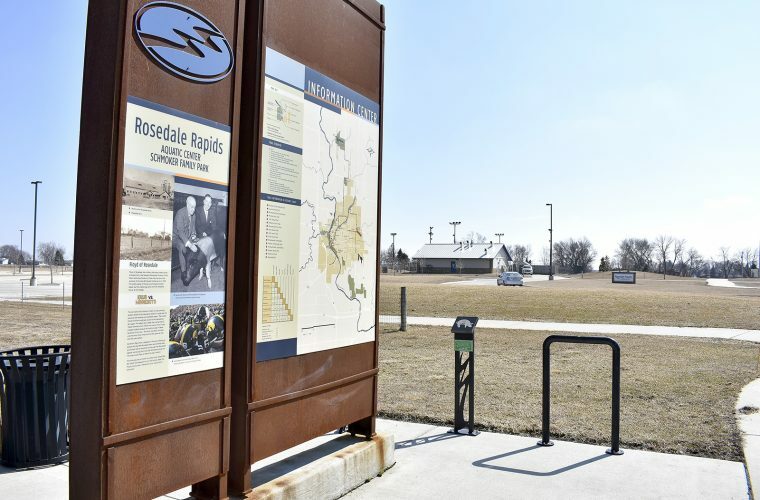 “My family and I experienced this kindness firsthand, and we are very lucky to have come from a school district that truly cares,” she said. In going forward, Garman said she has faith in her fellow graduates to succeed. 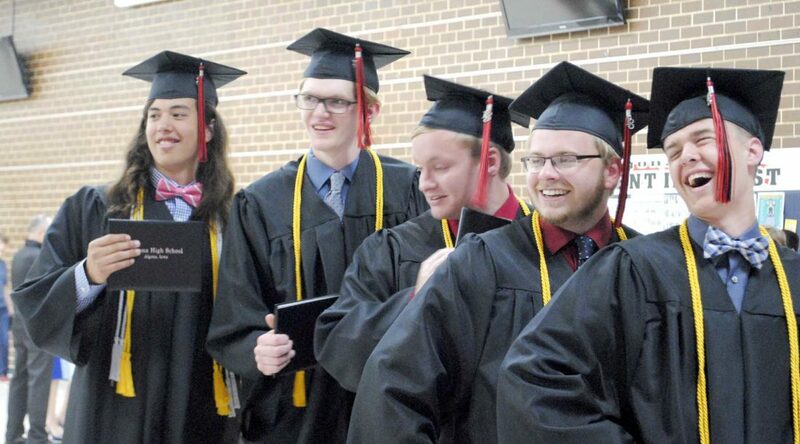 Zach Ortloff, Dylan Hauptmann, Paker Meyer, Kellen Schmidt and Collin Yi laugh as they pose for a photo with their diplomas following the Algona High School graduation Sunday afternoon. Davis challenged the graduates to find their way in the world on their own trails. Davis told the students to step out of their comfort zones as they pave their way into the future. Students who complete a total of 140 hours of community service over their four years of high school received a silver cord. Twenty- two graduates earned silver cords. Graduates with a grade-point average of 3.4 or higher donned gold cords around their necks. This year, 44 seniors graduated with gold cord honors. Various scholarship and award recipients were also announced before each graduate crossed the stage to receive a diploma.